on Saturday 11th, Prof de Mattei will address the LMS Annual General Meeting. 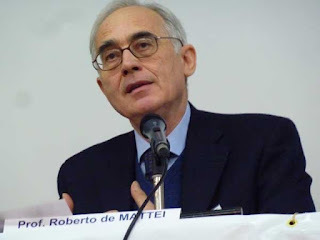 Roberto de Mattei is a professor of history based in Rome, increasingly well known in Traditional Catholic circles, very much worth hearing on the issues of the day. 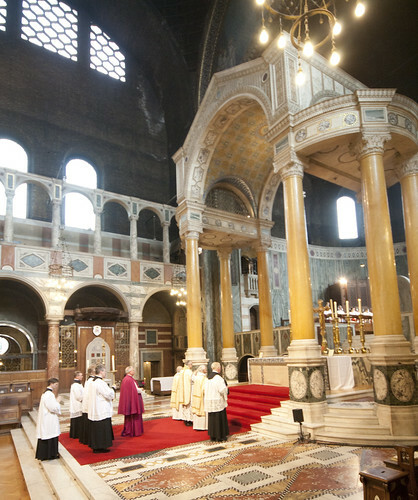 Following the success of the 10th Anniversary Michael Davies Conference last year, there will be a Sung Requiem Mass at 5:30pm celebrated by Fr Timothy Finigan, and a Memorial Lecture at 6:30pm given by Prof de Mattei, in the Church (and the hall) of Our Lady of the Assumption, Warwick Street, London W1B 5LZ (click for a map). There will be a nominal charge of £5 on the door of the talk to defray our costs. 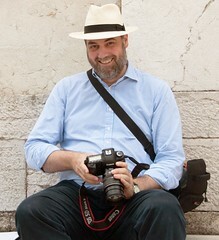 Mass will be accompanied with polyphony, provided by Cantus Magnus under Matthew Schellhorn. A buffet lunch is provided for those who book in advance and pay a fiver: see the LMS website for how to do this. This is followed by High Mass in the Cathedral at 2pm, a Votive Mass of the Precious Blood, accompanied by polyphony provided by singers of the Cathedral Choir. The Cathedral is dedicated to the Precious Blood, whose feast in the EF is 1st July (it does not exist in the OF calendar). Mass is of course open to all.